BEFORE: After a very relaxing day off yesterday, movie marathon continues with a double feature. 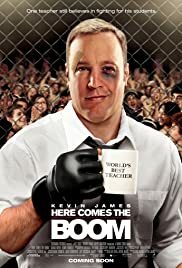 First up for today is the new Kevin James comedy, Here Comes the Boom. This advanced screening was bright and early this morning at 10:00 and as you can imagine, the theater was nowhere near full capacity. That means prime seats right in the center. But now it’s time to quiet down, the movie’s starting. AFTER: Immediately, thoughts of Warrior and Waiting for “Superman” / Won’t Back Down came to mind with a very clear, and quite bizarre, mix between education problems and MMA fighting. Sad to say, Here Comes the Boom falls right in the middle and fails to achieve the successes of the aforementioned films. Don’t get me wrong, Here Comes the Boom is by no means a bad film. In fact there were a handful of funny scenes and overall it was quite entertaining. But there wasn’t really anything that stood out about this film. The strength of Warrior was the intense and exhilarating fights. The strength of Waiting for “Superman”, and to a much lesser extent Won’t Back Down, is the emotional reaction you have to the peril the kids are put through with public education. Here Comes the Boom features these same elements but fails to do both, or even just one, spectacularly. Average would be a perfect word to describe this film. There are some positives and negatives but for the most part, everything is really just neutral. If you see it, will you enjoy it? Yes, the film can be quite entertaining at times and there’s no big detractor from seeing it. But the question is, should Here Comes the Boom be a film you see in theaters? That answer would probably be no. While there is entertainment value, it’s not worth the $11.00 of admission to see it in theaters (especially when compared to Argo which also opens the same weekend). Here Comes the Boom opens in theaters on October 12.